In the community of the first century, Christians faced two basic problems. The first was the problem of persecution against Christians and for the Jewish believers it would come from both the pagans in the Roman Empire as well as from certain Jews within the Jewish community who rejected Jesus’ claims to be the Messiah. The second area of conflict was within the church. Outside the church was the problem of persecution; inside the church was the problem of false doctrine. Believers at that time lived within a pluralistic society in Rome where there were many different religious beliefs, a number of different religious systems that came from not only traditional Greco-Roman religions, but also from ideas that were synthesized from outside the Greco-Roman culture. So there was a challenge to Christians to stand firm in the faith, as the apostle Paul had warned them as well, and so the message of Jude is to contend for the faith. To view all video Bible studies in the Jude series, click here. 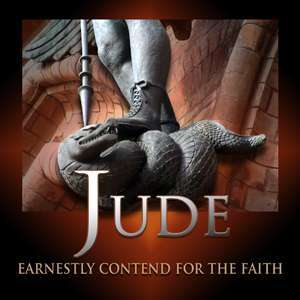 Jude’s exhortation to contend earnestly for the faith is a concept packed with vitality, hyper-vigilance and struggle that has internal, external and eternal effects. The battle for inerrancy of scripture, preservation of the faith without dilution, rejection of apostasy, authority of the Bible and identification of false teachers demands an understanding of essentials and nonessentials of the faith. See how the historical emergence of fundamentalism came about to counter the effects of modernism in Christian theology. Is God’s Word truth? Does the Bible contradict itself or need human correction? Are there two creation stories which give us an argument for multiple authors with one redactor who edits the text, possibly adding or changing elements to improve upon what was originally written? May we read more deeply into scripture for secondary meanings and compare that to ideas of other interpreters? Learn what it means to trust God’s original, written revelation as sufficient, inerrant truth.